65 years, 0 month, 8 days old age. 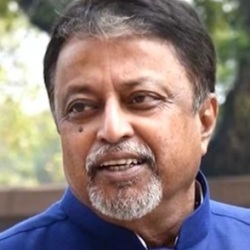 Mukul Roy will turn 66 on 17 April, 2020. Only 11 months, 22 days, 21 hours, 45 minutes has left for his next birthday. Mukul Roy has celebrated the total number of 65 birthdays till date. See the analysis by days count and bar graph. Mukul Roy was born on 17-04-1954 in Kanchrapara, North 24 Parganas in the state of West Bengal, India. He is an Indian Politician who presently belongs to BJP (Bharatiya Janta Party). He has served as a Railway Minister of India & Cabinet Minister. He was born to Jugal Nath Roy & Rekha Roy. He is married to Krishna Roy & together has a son Subhranshu Roy. His son is an MLA belongs to All India Trinamool Congress party who represent the Bijpur, West Bengal.